Tea infused gin is a hot trend at the moment. I happen to have a huge collection of fun and exotic teas so I tried a few out for tea infused gins this week. One for my Wild Hibiscus Gin & Tonic, one for my Butterfly Pea Flower and Elderflower Gin & Tonic and another, at the last minute, using some mint green tea. 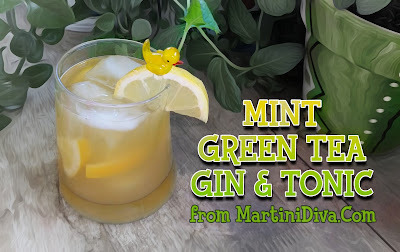 That was a great last minute addition, the mint flavored green tea went wonderfully with the gin I chose, Daffy's Gin, which has strong mint and lemon notes and, with the use of lemon in place of the typical G&T lime, I ended up with a bright and thirst-quenching drink. There's something about tea and gin and tonic, it's so perfectly British. It's also a great cocktail combination. DIRECTIONS Preparation: * An hour or more before serving your cocktails add one tea bag of Mint Green Tea for every one and a half ounces of gin and allow to infuse. Strain and set aside for the cocktails. ** Make the Lemon Créme Honey Syrup by mixing 2 tablespoons of hot water with 2 tablespoons of Honey Ridge Farms Honey Créme Lemon. 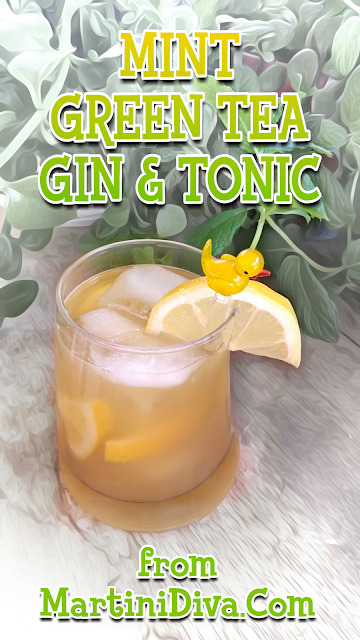 For each Cocktail: Add the mint green tea infused gin to a highball glass filled with ice. Squeeze in the lemon wedges, then drop the wedges in the drink. Add the Lemon Créme Honey Syrup and stir. Top off with the tonuc, stir again, garnish and serve. National Gin & Tonic Day is April 9th.